OCZ has achieved another milestone by launching OCZ DDR2 PC2-8800 Gold Dual Channel RAM running at 1100 Mhz (1.1 Ghz). The new memory modules are the fastest memory modules in the world as of now. XTC (Xtreme Thermal Convection) heatspreaders optimize the thermal management of memory modules by promoting greater airflow by means of micro-convection throughout what is usually the dead air space inside conventional heatspreader designs. In this manner, build-up of heat is avoided and thermal dissipation of the memory components is offloaded more efficiently through the honeycomb design. At the same time, mechanical stability is maintained. OCZ Technology Group, a worldwide leader in innovative, ultra-high performance and high reliability memory, today announced the first ever production DDR2-1100 modules, developed for the latest processors from AMD� and Intel�. The new OCZ PC2-8800 Gold Edition will offer computer enthusiasts and gamers unparalleled performance and the piece of mind they are guaranteed to produce the world�s fastest memory speeds within their personal desktop or gaming system. With AMD AM2 and Intel Conroe processors both supporting DDR2, consumers are now concerned with fast, high speed DDR2. The PC2-8800 Gold Edition is not only optimized for the latest CPU architectures, but demonstrates OCZ�s commitment to consistently offer customers the innovative solutions they demand while forging ahead of platform technology and inevitably challenging the industry to develop higher performing DDR2 platforms. OCZ PC2-8800 Gold Edition modules are rated to run at 5-6-6 timings and will be available in dual channel 2GB (2×1024) kits. 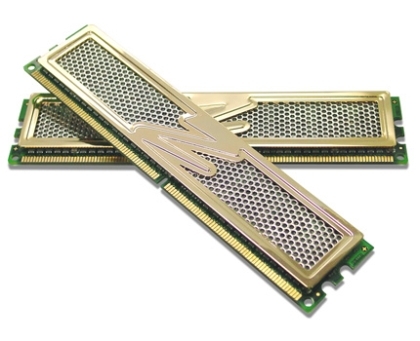 The unique design used in the award winning OCZ XTC heatspreaders optimizes the thermal management of memory modules by promoting greater airflow than conventional heatspreader designs. All OCZ Technology memory is backed by an industry-leading Lifetime Warranty and direct Technical Support. allow me to grab your RSS feed to keep updated with forthcominhg post. Thanks a million and please carry on tthe enjoytable work.